Sweatcoin Review: Is Sweatcoin Legit or a Scam? How Much Did I Make? I’ll admit that I was skeptical that I could actually make money walking with the Sweatcoin app. Surely it must be a scam, right? Something that pays you to do something as simple as walking can’t be legit, can it? Well, good news: Sweatcoin is not a scam. You will get paid to walk, which is obviously one of our top 31 easiest ways to make extra money in 2018. However, you should not have unreasonable expectations. You will make some money, but it’s not like you will be making hundreds of dollars a day simply by walking. Click here to download Sweatcoin and start making money walking. How Much Have I Made With Sweatcoin? How much you can make with Sweatcoin depends on how active you are. Now, I don’t know how active you are. I don’t know if you’re a marathon runner or someone who barely gets off the couch. So I can’t tell you how much you’ll make with Sweatcoin, but hopefully you’ll be able to figure that out after you see how I break down how much I’ve made with Sweatcoin. In 3 Months, I Made About 600 Sweatcoins. One of my resolutions this year was to walk at least 5,000 steps a day. This is when I downloaded Sweatcoin to inspire me to reach this goal. Since the beginning of the year, I’ve actually averaged about 7,500 steps a day. So as of the time of writing at the end of March, I’ve made 602.66 Sweatcoins and averaging about 7,500 steps a day. This Is Worth Either $30 or $8, Depending On When I Cash Out. So how much are my 602.66 Sweatcoins worth? Well, let’s do some quick math. There are two ways to convert Sweatcoin into PayPal cash, and each of these ways yields a different value for Sweatcoin. If I Cash Out Early, Then I’ve Made $8. So if I wanted to cash my Sweatcoins out relatively quickly, I wait until I have 3,650 sweatcoins saved up, when I could exchange them for $50 cash via PayPal. If you divide $50 by 3,650 Sweatcoins, this means that each Sweatcoin is worth about $0.0137 each. If I multiply my 602.66 Sweatcoins by $0.0137, I get $8.26. So if I’m planing on cashing out my Sweatcoins in the next year, you could say that I made $8.26 from Sweatcoin in a few months. If I Wait to Cash Out, Then I’ve Made $30. Have you ever heard the expression, “Good things come to those who wait”? Well, it’s certainly true when it comes to Sweatcoins, because you can over triple the value of your Sweatcoins if you are willing to wait to cash out. See, in addition to the 3,650 Sweatcoins for $50 option, there is also the option to exchange 20,000 Sweatcoins for $1,000. If you divide $1,000 by 20,000 Sweatcoins, this means that each Sweatcoin is worth about $0.05 each. If I multiply my 602.66 Sweatcoins by $0.05, I get $30.13. So if I’m planing on waiting a few years to cash out my Sweatcoins — or just become a lot more active than I am today — you could say that I made $30.13 from Sweatcoin in a few months. So Is Sweatcoin Worth It? Yes, for me, Sweatcoin is certainly worth it. I am getting paid to do something — walking — that I would do anyway. You Really Do Make Money for Walking. Believe it or not, you do get paid for walking with Sweatcoin. In my opinion, this makes the Sweatcoin app definitely worth it! I know that Sweatcoin has helped me become healthier. See, I’m really into personal finance. Money’s kind of my thing. I like making money, I like saving money, and I like investing money for passive income. And my financial goals sometimes get in the way of my health goals. Lots of the time I would rather spend my time working on this blog or on other ways of making money than on my health by exercising. But Sweatcoin has helped to inspire me to exercise more because I know that when I’m out walking or running, I am also in some small way making more money. www1.sweatco.in/i/rolfvandermeulen Check out this free app 👆 It pays to walk! I will send 5$ Sweatcoin to your account sign up and follow me ? It won’t let me get past my number. I enter my phone # and it says network error. That’s all I get no further. This app is incredibly worth it and i vouch for it. Making the money goes by alot faster if you’re inviting people as well. I have 400 invites and if u multiply that by 5 , you get 2,000 swc. So it’s now a pyramid scheme? HOW DO I CASH OUT? PLEASE HELP ME!!! From my understanding there is no way to cash out using the Sweatcoin app. I’ve had it for a couple of months now and have about 200 Sweatcoins, but they don’t have a way to convert to actual money yet. According to the creators that is actually their long time goal, but it is not yet possible. They only have online offers you can exchange your Sweatcoins for. Hey help me out here ? I recently downloaded the app and tried it today.. I did a long walk and did open the ap before i started my journey.. I tried tracking my steps while walking and it was working.. However when i close my phone the app stops counting the steps .. Do we have to like on the phone throughout ?? Please tell me how does it works ? I did 16.485 steps in a day and I did 9.04 Sweatcoins, if you divide 16.485 over 9.04 that give you 1823.45, that means that 1823.45 is the worth of every single Sweatcoin, that’s the way it is, greetings from Virginia/USA. I know it only records outdoors, but why would it vary from morning to night? I go out with my doggy in the morning (daylight) and earn about 2,000 steps. We go out at night when it is cooler and traversing the same route I only get about 800. Does being in the dark or moving a bit slower matter? The real question is what are they doing with all of the data they are collecting from each person that they are “paying to walk”. You are giving them access to you gps all the time. Who are they then selling that info too. So they can pay you .001 for every mile!?!???????? I’ll keep my privacy and peace of mind then getting paid $8-30. The thing I don’t like is I walk over 10000 steps a day at work but the app only counts 2000 of those steps if that. Okay so I had the app for almost a year and only made 120 in app dollars which amounts to about $1.25-$1.30 they false advertise and it’s a scam. They don’t count your indoor steps only the steps you take outside and the app kills your battery faster than it can count your steps. There is no way to cash out your Sweatcoins from my understanding. Of you go to the FAQs you can see the creators say there is no eay to convert sweatcoins to actual money yet, but they are working on it. They only have online offers at the moment. I retired a couple of years ago, and am a dog walker, walking a couple of neighbour’s dog and my own. Typically I rack up 15,000 steps a day, or 15 sweatcoins a day. Walking dogs 20 days a month = 300 sweatcoins/month. If I go with the 20,000 sweatcoins for $1000 from PayPal, that equals 66.6 months, or 5 1/2 years. A $50 NIKE Gift card requiring 3,650 sweatcoins equals 12.1 months of walking, or one year. Is it worth it? An extra $50 per year is nothing (about the same I make for walking dogs in a day), but it is free money. The down side is the extra drain on your battery (which doesn’t last for ever) and may require a battery replacement a lot sooner than expected, and can be costly. As I tend to keep a cellphone for many years before upgrading, I’d likely have to replace the battery before replacing the cellphone. If battery replacement costs $100, then that’s the same as walking for 2 years to pay for the repayment. Although I don’t consider this a scam, I’m not convinced this is worth my time to collect. Well I wouldn’t want to put anyone off doing some exercise and if this is the motivator that works for you then go for it, well done and good luck. But simple maths tells me that as a means of making money, it’s pretty much useless. Let’s take the example in the post. 7,500 steps a day every day for 3 months is excellent going..
After all that walking we have earnt just over 600 sweat coins, so we’re generating around 200 a month. We want to hit the $1,000 PayPal cash out. We need to get 20,000 sweat coins to do that. At 7,500 steps a day, 200 sweat coins a month, that’s going to take us… 100 months. Or in more simple terms, a little over 8 years. Now call me a little cynical, but sweat coin might not still be around in 8 years. PayPal might not still be around in 8 years (it’s only 19 years old). Heck I might not still be around in 8 years. 8 years to earn $1,000. Sweatcoin is really the one getting paid…and the creator of it is not even walking..I bet! 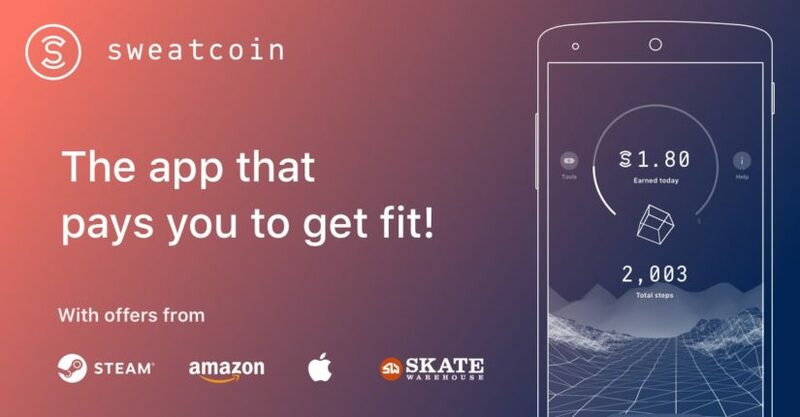 The more apps and info Sweatcoin attains, the richer it gets! So download my app and I will give you a few pennies too! I label it as a scam bc Sweatcoin goal is to get rich by making you believe your walking and getting paid is a concern of theirs! I disagree because it pays you a small amount of money to walk something you usually do anyway. Sweatcoin is gathering your personal data through your GPS information and selling it to other companies in order to finance it’s own app. It’s a scam. $50 a year is nothing. If ure at the 1st level it’s over 2 years to get 50$…? !!! So, unless u walk EVERYWHERE, (and I mean miles!) it is NOT worth it to keep and use as an app. Total rip off. Total rip off? Are you kidding me? They are giving you something for walking (the health benefits should be intrinsically motivating). It’s up to you how you value your personal data and battery health, but to call it a rip off? That’s a ‘step’ too far. If you need to be paid money in order to not be a fatty, maybe it’s karma that someone is selling your personal data. The thing to I think you are also missing when you are looking at the additional levels and commenting on how little you are earning – they aren’t charging you a cent of money outside of what you have earned through the app. It’s all paid with sweat coins. I would also add – this app has given my son some motivation to walk and get some exercise. Maybe being motivated by cash is not the best thing, but iits working just the same. In regards to being a scam because they are getting all your information – what do Google, Facebook or any other social media or search engine give you for all the macro and micro data they collect on you on a daily basis? They don’t give me anything. But then again, I have my privacy setting restricted, so they aren’t gathering any of my personal data. I’m just gonna day that if I have it running in the background and I forget about it then when I remember it I could have tons because it automatically cashed at 2000 steps. There is no downside to having it, as it has a battery saver option. Please don’t take this the wrong way, I’m not angry. I’ve done this. I’ve let the app sit for two months without opening it, but when I do it says I “failed to collect data in time” and I didn’t get those days counted. I went hiking last summer. 105 miles in two weeks and it didn’t track a single step even though I was hiking in a national park. You do NOT get cash!!! You can only buy from the online products at this time. And I have had 39,930 steps for the last 2 days and it has not sent any(suppose to send ever 2000 steps automatically) and they take 5% of you sweatcoins as a commission.